In 2006, I went on pilgrimage to Peru to learn and partake in the ancient spiritual teachings of the Andean people. This was a life-changing experience for me and their wisdom continues to inform my spiritual life. I’ve written about some of these teachings and the intention behind the journey (based on the Prophecy of the Eagle and the Condor) on my blog. Click here to read more. One of the most sacred rituals performed there is the despacho ceremony which are ceremonies of gratitude and thanksgiving to Pachamama (Mother Earth) or an Apus. While in Peru, we were told that the despacho is also considered a work of art, or a painting. It was at that moment I had a vision for the painting above. I knew when I returned home that I would create my own despacho, and then paint it as an offering to Pachamama. The “despacho” is an ancient ceremony performed in the Andes. 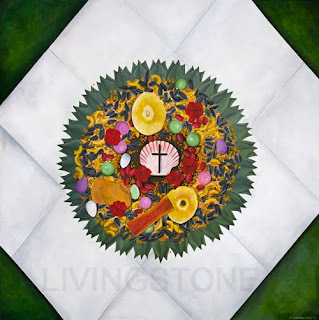 These are offerings to either Pachamama (Mother Earth) or an Apus (mountain spirit). The former is distinguished by an abundance of red objects/flowers, the latter by white. They typically begin with a shell in the center to represent the feminine, a cross to represent the masculine, and Kintus (3 cocoa leaves grouped together). In the Andes, additional items might include money, food items, ribbons, alcohol, dung, or a llama fetus. These are determined by the paqo or shaman performing the ceremony which is very elaborate and includes praying, group cocoa exchange as well as music and sharing of the pipe. Overall this was a magical and mystical experience for me and words just don’t do it justice. For my painting, I went to the local market, chose items I felt would please Pachamama, and created my own despacho which I then painted as an offering. My process is one of devotion and is a prayer for the healing of the earth. Ayni, or reciprocity, is at the core of the Andean way of life and rituals like the despacho honor our relationships to the earth, the living energy, and to each other. This past weekend, I was invited and honored to share this ceremony with my spiritual community, People of the Heart, during one of our shamanic training retreats. I substituted the cocoa leaves, which are illegal in the States, with another of the leaf family but included many sweets, grains, seeds, herbs, jewels, red flowers, and miscellaneous goodies that I felt would please Pachamama. Drumming and rattling. With reverence and gratitude, we each offered these gifts as prayers for healing ourselves, each other, and our world. Singing. When the ceremony was complete I bundled up the despacho, wrapped it in ribbon, and placed it in a cloth. Sending the bundle around the circle, we blew our breath and our prayers into the despacho. Drumming. After blessing everyone in the circle and a closing poem, we then buried the bundle on the land. I feel humbled by the simple beauty of this ritual as a gift for the healing of our world, and the Earth. I give thanks to my teachers: dear friends and guides Carol, Jim, Terence; don Sebastian of the Q’ero; and the Winay Taki for sharing their wisdom with me/us. In a time of returning, we give voice to the heart of the Earth. With countless others awakening we walk upon Her now. Women of Vision speaking to inspire what follows. Men of Heart embracing, to shape new ways to live. And sustaining our interconnection with all life. Sun, Moon, Stars, Earth, and Great Mountain Spirits. The prophecy story relates that in the beginning all the earth’s people were one, but long ago they divided into two groups, and each one followed a different path to development. The people of the Eagle became highly scientific and intellectual, indicative of a masculine energy. This would represent those of us living in the industrialized West. Whereas, the people of the Condor became highly attuned to nature and the intuitive realm, or what might be the feminine energy. This refers to the indigenous peoples—or the people of the heart. It was foretold in the ancient prophecy that during this period of time, or what is referred to as the Fifth Pachacuti (world turned upside down), civilization would be on the brink of collapse which we are now seeing in the extensive ecological degradation of the planet as well as the recent breakdown of our economic structures. The prophecy says that at this time in the earth’s history, the Eagle people and the Condor people will rejoin. Remembering that they are one people, they will reconnect, remember their common origin, share their knowledge and wisdom, and save each other. The eagle and condor will fly together in the same sky, wing to wing, and the world will come into balance after a point of near extinction. Neither the eagles nor the condors will survive without this collaboration, and from this rejoining of the two peoples, a new alloy consciousness will emerge that honors the Eagle people for their remarkable accomplishments of the mind, and honors the Condor people for the deep wisdom of the heart. Together—and only together—the crisis will be resolved and a sustainable future will emerge for all. As a small community, or allyu, we visited the holy sites of Machu Picchu, Tipon, Ollantaytambo, and Pisaq where we spent time in ceremony and learning from a native community—dear friends/family of our leaders—who are bringing back the ancient ways under the tutelage of the Q’ero shamans. This wonderful community of men, women, and children opened their hearts to us, invited us into their world, and shared their great wisdom (and music!) with us. I felt a profound connection to all the people of Peru as well as to the Earth, or Pachamama as she is known in South America. This truly was a sacred encounter between the eagle and the condor. What a gift to undertake this journey as so many others who are now being called to this holy land. Our allyu was additionally blessed to encounter His Holiness the Dalai Lama in Cusco while he was there making a visit to meet with the Q’eros people, who continue to live high in the Andes and live in reciprocity, or ayni, with Pachamama. When I returned I was inspired to begin a series of artworks around this journey and am continuing the project at this time. I also felt called to create an icon or logo that would integrate the wisdom of these teachings to represent the long term vision for my work in the world and the studio. The result is a synthesis of the Inka Cross and the mandala (see Shri Yantra Mandala post for more information on mandalas). The Inka Cross (or Chakana) traditionally has wider sections in the north, east, south, and west quadrants, but I felt inspired to emphasize the symmetry throughout the piece to symbolize the balance between the masculine and feminine—as represented by the sun/moon and the yin/yang symbols. The spiral in the North represents the deepening spiritual journey that is needed for all beings to bring about the new emerging consciousness that the prophecy speaks to. The three-stepped quadrants in each of the four directions symbolize: the places we meet or the three realms (upper, middle, lower), the spirit helpers for each realm (condor, puma, serpent), what we bring to community (mind, body, heart) and the three ways we come together in community (labor for all, connection, reciprocity). The Inka cross essentially represents a spiritual and ethical framework for living in harmony with each other and the Earth. And at the center my icon is the heart of the world—love—which is my vision for a world at peace and one that honors the Earth and all life upon her. May it be so. Aho.